Lady GaGa turned to her friend Azzedine Alaia to create some of the outfits she wore at the Victoria's Secret Fashion Show. Lady GaGa's Victoria's Secret finale outfit felt like an ''affair''. The 'Born This Way' singer donned a stunning Azzedine Alaia sheer lace crop top and trousers set at the end of the lingerie show in Paris on Wednesday (30.11.16) evening - where she was one of the musical performers alongside Bruno Mars and The Weeknd - and was honoured to wear such a spectacular outfit. 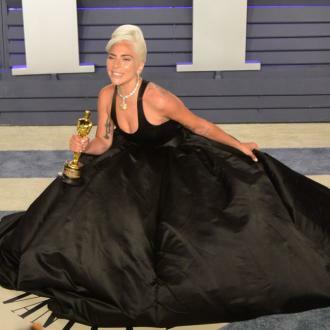 The designer also created the gown she wore on the Pink Carpet ahead of the show, and Gaga was very grateful for his support. Gaga had a number of costume changes during the show, including a sequinned jumpsuit, worn with and without sleeves, as well as teamed with a white leather jacket, and a black and red long dress which was teamed with her very own angel wings. But backstage, the 30-year-old star kept things simple in Victoria's Secret signature white bra and pants set and thanked the company and the models for letting her be a part of the event.